For the past couple of years, Holy Cross has been experimenting with periodic “Come With Joy” Sundays. These are inspired by a ministry of Caroline Fairless and Jim Sims called Children at Worship ~ Congregations in Bloom. Caroline, an Episcopal priest, and her husband Jim, a musician and composer, have a mission to make Episcopal worship more attractive to children, teens and young adults. They bring a rich array of music, drama, visual arts and other exciting ideas to Sunday morning Eucharists. 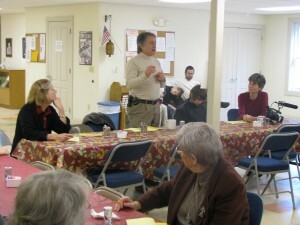 Caroline Fairless (left) listens as Jim Sims talks about their ministry over Sunday morning breakfast. Each year we schedule six or eight Come With Joy Sundays. (Jim joins us with his guitar once a month for our regular worship.) A survey and discussion of our worship revealed that the great majority of us like these occasional “freer” Sundays, though we wouldn’t want they all the time. Liturgy is very important for Episcopalians (we even have that special name, liturgy, for how worship: literally meaning “the work of the people”). We value worship that brings Holy Scripture, tradition, the Sacraments and beautiful music and environment together to the glory of God and the enrichment of God’s people. Therefore, when we make changes–which we do–we do this carefully, thoughtfully. At the same time, Holy Cross is an ideal place for something like “Come With Joy.” We’re a young congregation, generally open to new ideas and ready to give them a go. Our special mission is to young families and we have welcomed the gifts that Caroline and Jim have brought to us as we develop our worship.